Eastern Yellow Jackets are approximately 1/2 inch long. They have alternating black and yellow stripes and are not as hairy as bees. Their wings are a smoky color. Yellow jackets build nests, usually in the ground or in old tree stumps near the ground. They sometimes build them in walls of buildings or similar places. Yellow Jackets, like most wasps, can sting repeatedly, and will do so when threatened. The females are the only ones with stingers. 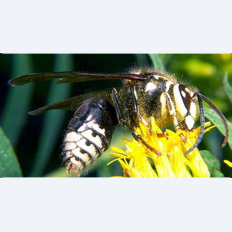 Baldfaced hornets are black and white, heavy-bodied wasps about 1/2 – 3/4 inch long. They usually build exposed, grey nests in trees or shrubs. Occasionally, they will build nests under roof overhangs, in attics, crawlspaces and wall voids, or under decks or porches. The nests are constructed of a paper-like material formed from chewed wood, and may exceed the size of a basketball. These hornets are extremely quick-moving and wary. The top row consists of sterile females – worker hornets. 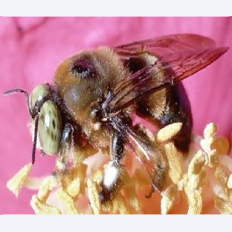 The general appearance of Killer Bees (Africanized Bees) is the same as common Honey Bees, but there are some distinctive physical differences between the two. To analyze the differences, a laboratory has to measure and compare some 20 different structures. Another way to check is to analyze the specimen’s DNA and enzymes. In 1956, some colonies of African Honey Bees were imported into Brazil, with the idea of cross-breeding them with local populations of Honey Bees to increase honey production. In 1957, twenty-six African queens, along with swarms of European worker bees, escaped from an experimental apiary about l00 miles south of Sao Paulo. These African bee escapees have since formed hybrid populations with European Honey Bees, both feral and from commercial hives. Africanized Honey Bees (Killer Bees) are dangerous because they attack intruders in numbers much greater than European Honey Bees. Since their introduction into Brazil, they have killed some 1,000 humans, with victims receiving ten times as many stings than from the European strain. They react to disturbances ten times faster than European Honey Bees, and will chase a person a quarter of a mile. Honey Bees are an animal most of us learn about very early on, one way or another. In Summer, many people step on Honey Bees and get stung while walking barefoot on a lawn. Honey Bees are usually very gentle creatures who mind their own business. They are too busy to worry about people or other animals. Honey Bees are normally about 3/4 of an inch long. Most bees are workers, which are female, but some are male, called “drones.” Workers are slightly smaller than drones. 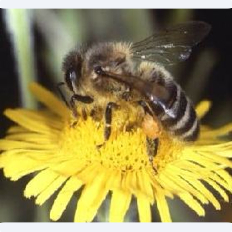 All Honey Bees are reddish brown and black, with orangish-yellow rings on the abdomen (back part of body). The head, antennae, and legs are black. 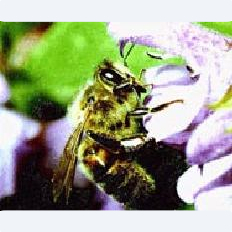 Honey Bees have thick, pale hair on the thorax (middle part of body). Paper wasp – Polistes sp. Paper wasps are 3/4 to 1 inch long, slender, narrow-waisted wasps with smoky black wings that are folded lengthwise when at rest. Body coloration varies with species: Polistes exclamans is brown with yellow markings on the head, thorax and bands on the abdomen; Polistes carolina is overall reddish-brown. 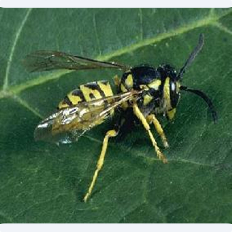 Paper wasps should not be confused with yellowjackets and baldfaced hornets. 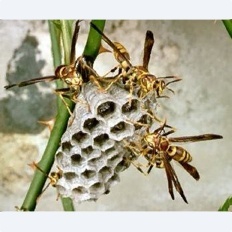 Paper wasp nests are open and cells are not covered with a cap. Adult body length is about 1/2 to1 inch (12.5 to 25 mm). They are robust, resembling bumble bees, but larger, with the top surface of abdomen mostly bare and shiny. The male has a yellow face. The female’s is black. They can resemble bumble bees, but the upper surface of their abdomen is bare and shiny black, while bumble bees have a hairy abdomen with at least some yellow markings. Bumble bees don’t nest in the wood, but rather on the ground. They are perfectly round, about 3/8 ” in diameter. The female carpenter bee will bore a channel or main corridor in the wood from 6 ” to as long as 4 feet to lay their eggs in “galleries”. She will deposit an egg, bring in a mass of pollen for the newly hatched larvae to feed on, and then seal it all off to ensure it’s development before she repeats the process for the next egg. Although, they are a wood boring insect, they are not considered a true structural pest. They do not spread through out the entire structure, but prefer unpainted or finished wood. These wasps reach up to 3 inch in length. Except for a rusty red head and thorax, they are overall black or rusty in color, with yellow band markings on the abdominal segments. They have russet colored wings. The cicada killer wasp and other digger wasps are solitary wasps; that is, they live independently rather than in colonies and do not depend on other members of a colony to share in the raising of young or the maintaining of a nest. Female cicada killer wasps capture annual cicadas in July and August and place them in cells located at the ends of tunnels they have dug in the ground. Each tunnel is about the size of a quarter and extends 24 inches or more into the ground. One or two paralyzed cicadas are placed in each cell, and a single egg deposited before the cell is closed by the female, who flies away, never to return. The wasp grubs feed on the cicadas and develop into wasps that emerge the following summer. 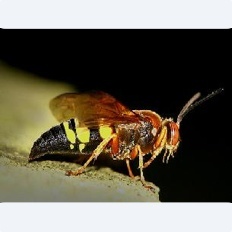 The cicada killer, like other solitary wasps, has the capability to sting, but won’t unless handled or threatened. Only female wasps have the ability to sting. Stings inflicted by solitary wasps are usually not severe but reaction varies with each individual.